Commercial instead and after some milling and searching I did a blind pick and chose to go try Shooters Waterfront Cafe. I have had no previous experience or much word of mouth advice on this establishment, so I was excited and a bit worried. On entry, at 9pm, it was not a full house. The location was clean, nicely lit with light music playing. The hostess was very pleasant and dealt nicely with the indecisiveness of us trying to decide to sit outside and deal with the wind and the cold on the water or stay inside. 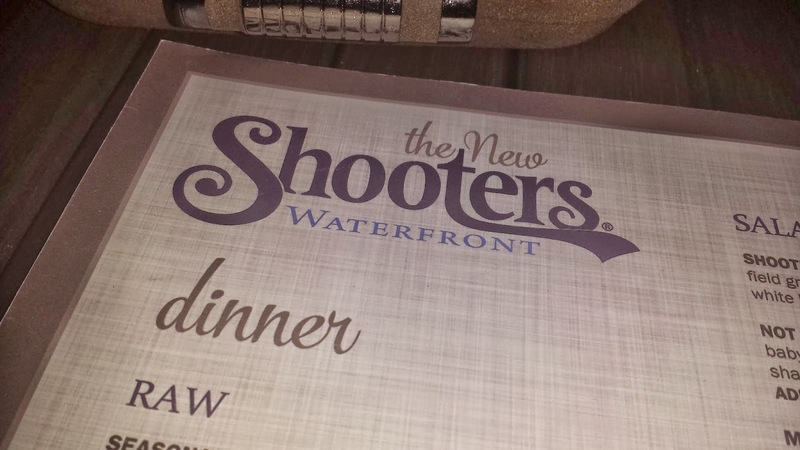 Shooters looks brand spanking new. It is all creme in color: on the walls, the chairs, the tables, the umbrellas. 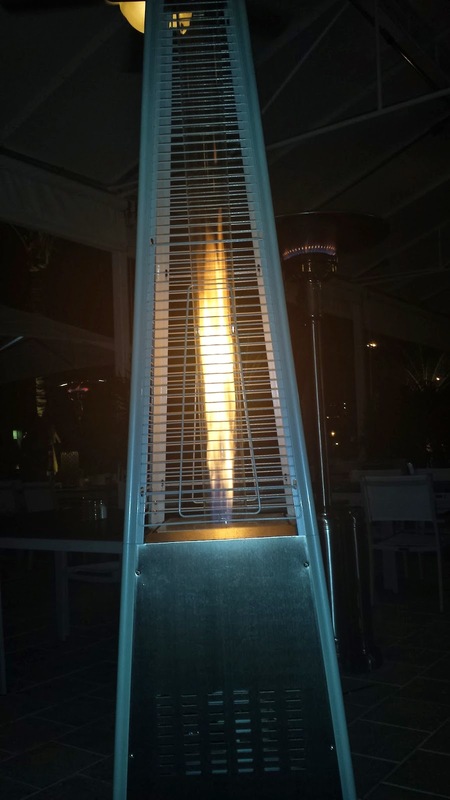 Last night it was hinted with metallic heaters, and fire pits and brown rattan couches. 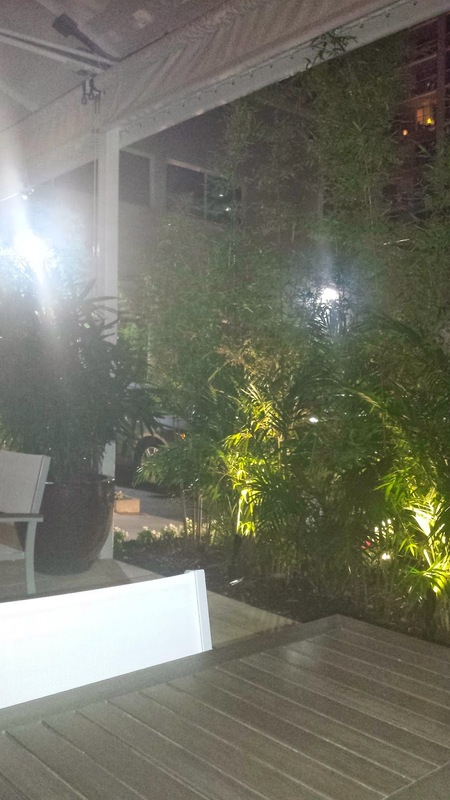 The outside area is also adorned with fake grass and a few greenery creating a wall to block off the valet parking area and the tall apartment buildings. 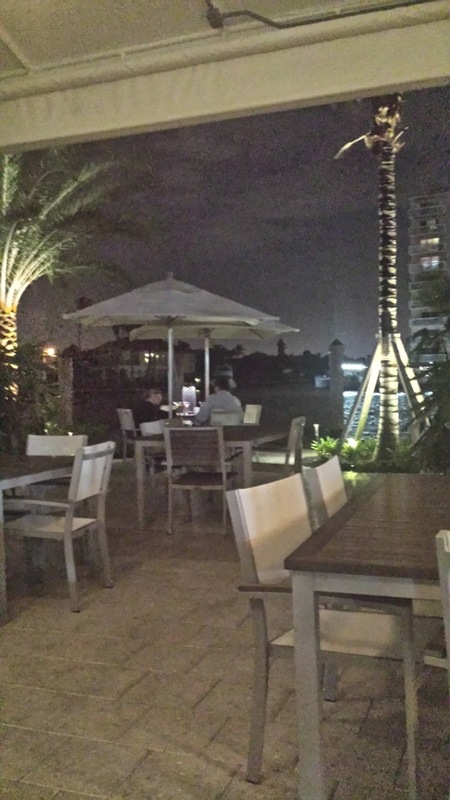 The ambiance is very relaxing and the view of the intercoastal is great. I was very appreciative of the warmers being out, especially that night, since it was a bit nippy. We opted to be seated outside and this is where our so far good experience gets not that great. We initially took seating out on the deck then after a few fights to keep our menus on the table we opted to move below the tent area. We were nicely moved by a server who then informed us he saw us sitting there a while fighting with the menu and decided to come over to us, but he was not our server and someone would be with us shortly. That shortly turned into about 20 minutes wait time. This included a wait time of watching some servers stand and chat with other customers, other servers passing by our table and smiling with us. Finally, a busser eventually passed and asked if we were OK, we asked to speak to the manager. And we wait. Ten minutes later our server finally appeared and informed us there was an altercation out front and they had to deal with it. Did I mention by this time the manager has walked by us about 5 times already? Hungry and annoyed I know it was going to be a hard night for our server Bryan. On to the food. I started off with a drink. Bryan suggested the Bikini Martini. And it was really good. 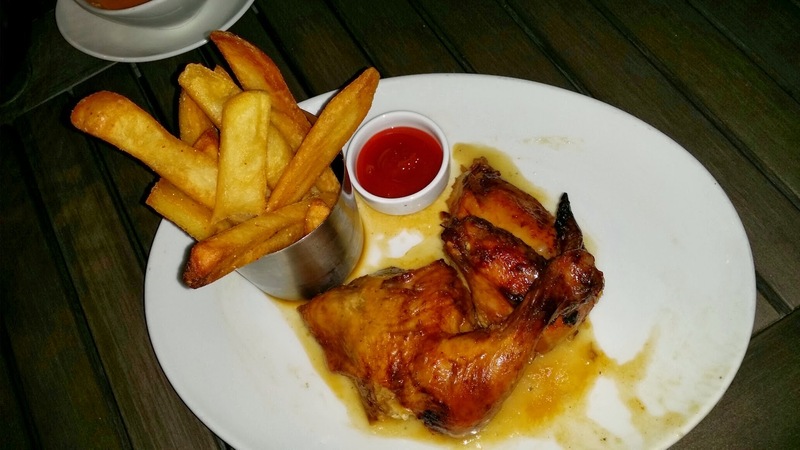 Also ordered appetizer to calm the hunger and another suggestion by our server was the grilled chicken wings. 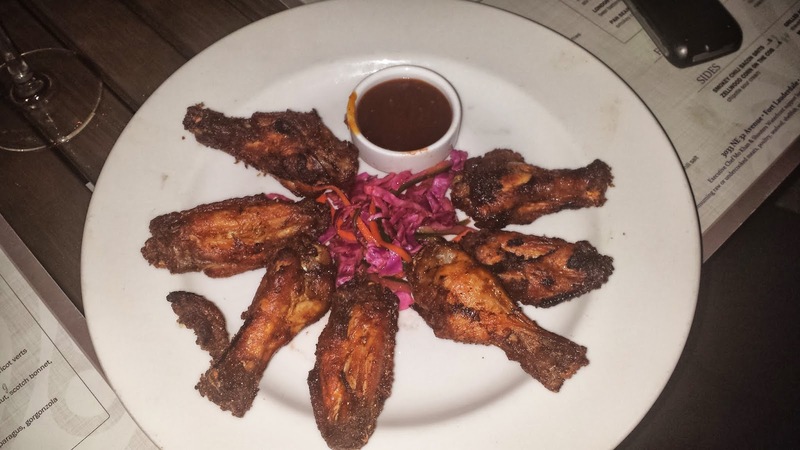 These wings are covered in a seasoning and fried and is accompanied with a guava glaze sauce. He warned us that it was hot but it was not even close to. With amazingly fast preparation our wings were out and they tasted really really good. That guava glaze is awesome sauce. 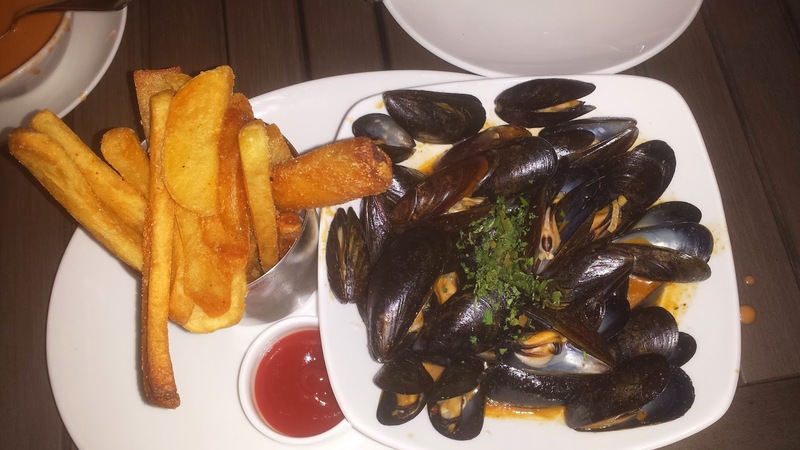 I was in the mood for seafood so I opted to get the mussels (this is an appetizer on the dinner menu) and we also ordered the 1/2 chicken with fries. Because of the delay with service, and missing manager Joe, I was given some lobster bisque in between the entree order being prepared. The bisque was as bisques are. Good, but a little salty. The gesture by Bryan was much appreciated. Then entree came. Again in surprisingly fast turn over time. The mussels were "Thai Mussels" in a coconut curry broth. Very tasty and really was enough to be had as an appetizer. The chicken was also very moist and flavorful. Tried to get some more of that guava awesomeness but it was replaced with barbecue sauce. The fries, both the plain and togarashi were good. Togarashi, in cause you didn't know, is a mix of seven chili spices. No dessert was ordered as dinner was fulling and it was also close to 11pm which is their closing time. Overall service was good at this newly reopened establishment. Our server made up very much for delay. He was apologetic, attentive and made sure we had no other complaints about service that night. Another worker Sean was also very helpful during the night, and quite entertaining. I would surely be visiting Shooters again. Especially during the day to take in the view and to have a few more drinks and experience their lunch menu. Shooters, I give you 4 out of 5 stars.